Continuing calm and settled sunny weather has illuminated even the shadiest corners of the patch over the last few days. Colours that were muted and drab over the long cold winter are shining and vibrant in the spring sun. 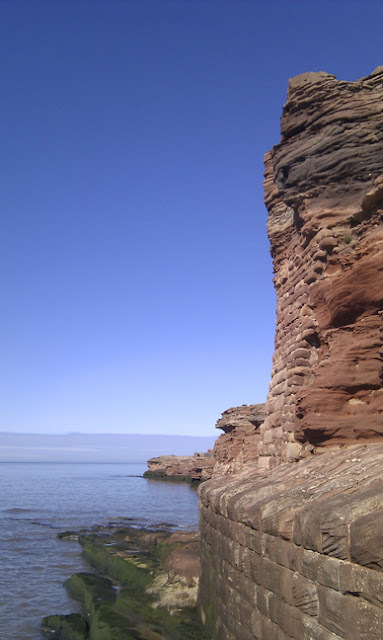 Nowhere is this more apparent than on Hilbre and I had a cracking trip there earlier this week. Wildlife and weather combined once again to provide a fantastic day with patch regulars. The sky was the best blue in the world. It started pale at the horizon then deepened past the colour we've just painted our bathroom then reaching a cobalt creshendo directly above. It was like a smack in the face with a blue paint pot. The scene was set and the cast flew and swam in to play their parts. Over on the sand banks the Atlantic Grey seals are hooting mournfully as the tide pushes them off their grainy bed and into nearly-as-blue-as-the-sky-but-not-quite waters of the Dee. They are the only bits of grey on the patch today. 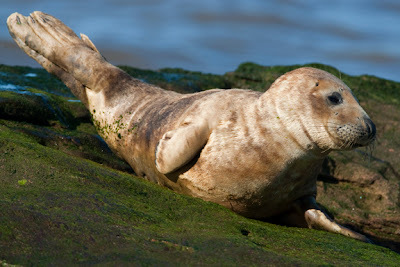 A Common Seal hauls out of the water by the lifeboat slip. I don't think it has been accepted by the Greys, it can't share the sandbank so it has to find a place to rest elsewhere. 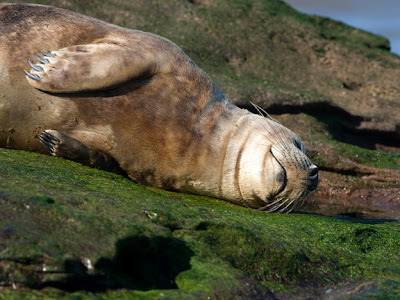 It flops along the rocks until it is well clear of the waves and settles down in the sun for a nap. It is a perfect day for such a relaxing activity and it seems to be totally chilled out. 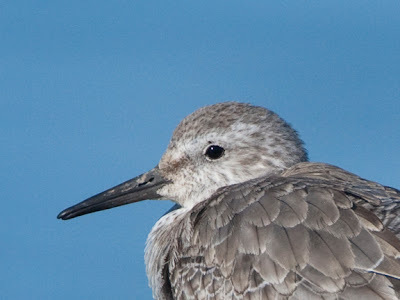 There are a few waders zooming about the island and a couple of Knots land close in. I am a big Knot fan and I take a while to have a good look at these two long distance migrants. The sea behind them is a paler blue than the sky overhead and is reflecting the light all around, the birds are brilliantly lit up so a few pictures are taken. They seem settled so I edge along the sandstone to get a little closer for a few more pictures. 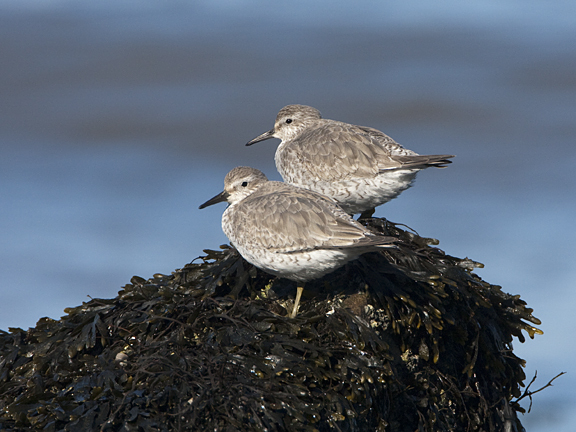 They zip off their perch and start to feed in the seaweed covered rocks with a platter of other wader delicacies. Turnstones are flipping bladderwrack, Purple Sands are washing in the rock pools, a Redshank bobs past. 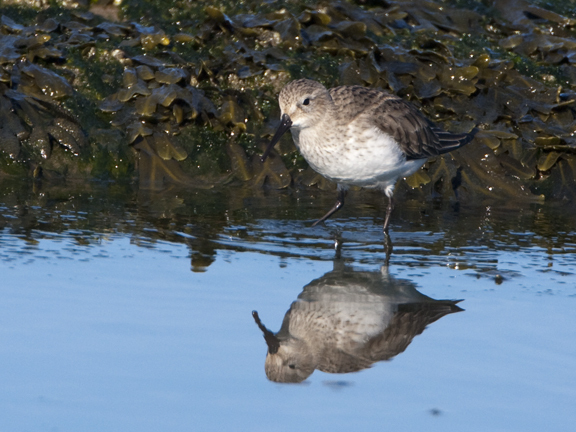 In a rock pool a Dunlin furiously pipes at the pools muddy bottom. There is almost no wind so the water of the pool is still save for the ripples of the Dunlin feeding. The pool's colour is somewhere between the blues of the sea and the sky. 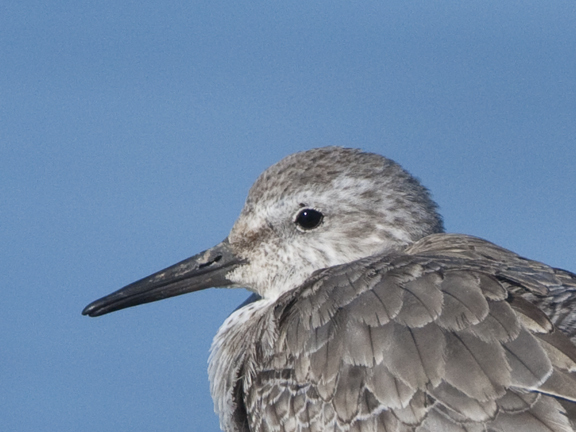 When the piping stops the reflection of the bird comes into focus. As the tide turns the birds follow the retreating waters edge feeding on the freshest seafood the Dee has to offer. It's getting close to my teatime too so I take in the blueness for a final time, soaking up the warmth of the sun, a shot of vitamin D. The sun is starting to set and my blue party starts to fade.